A Beast Man Digimon that evolved from Garurumon and gained the ability to walk on twos. 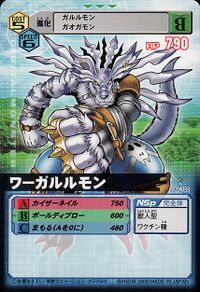 Its speed dropped as a result of turning bipedal, but it became a Commando Type Digimon with stronger offensive and defensive power, as well as developed a tactical nature. 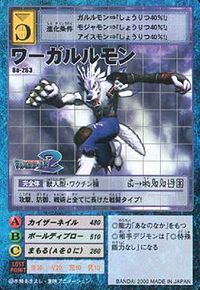 Its kicking techniques, which it unleashes using the leg strength it retained from when it was a Garurumon, are quite strong, and its jumping ability contends for first or second place among Digimon. Also, it is fiercely loyal and has a reliable nature, faithfully executing any task ordered by its master. 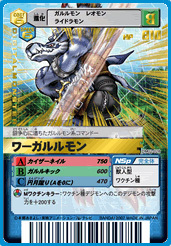 Its Special Move is cutting the opponent to pieces with the sharp claws on both of its hands (Kaiser Nail). An onomatopoeia for the sound of a growl. 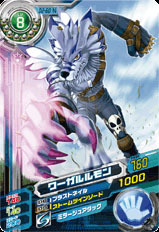 カイザーネイル Kaizā Neiru Wolf Claw Slashes at the opponent with its powerful claws. ボールディブロー Bōrudi Burō Blow Hard Punches the enemy with its spiked brass knuckles. フォックスファイアー Fokkusufaiā Fox Fire/Howling Blaster Fires high temperature blue flames from its mouth. Engetsugeri  Circle Moon Kick 円月蹴り N/A Moonsault Kick/Half Moon Kick A powerful kick that can fire a blade of energy at the opponent.. 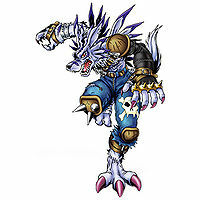 Were Garurumon from Digimon Adventure. Were Garurumon is the partner of Ishida Yamato. 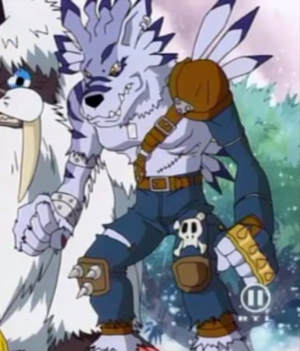 Gabumon first evolved into WereGarurumon when it was fighting Digitamamon. 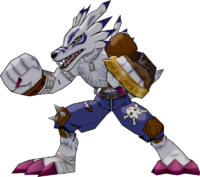 Were Garurumon is a Digimon that was removed from the game. It has no appearance and has a slighty different name in Japanese, ウェアガルルモン. It is intended to evolve naturally from Garurumon, Leomon, Yukidarumon, or Mojyamon with at least 30 g Weight, 4000 HP, 400 for Defense, Speed, and Brains, and 3 or less care mistakes. Its Finishing Technique appears to be Glacial Blast, the only Technique that was removed from the game. 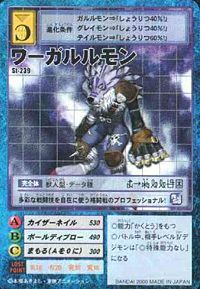 Despite this, there is an unobtainable evolution item to evolve any Adult Digimon into Were Garurumon known as Moonlight Mirror (月光の鏡 Gekkō no Kagami). 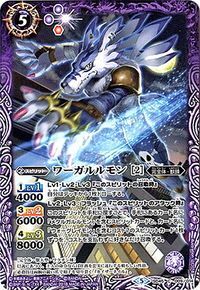 Were Garurumon is a Land-type Variable Digimon that can be learned by the combination of Gabumon and one of other 7 Chosen Children Digimon. Its technique, Kaiser Nail, attacks all opponents and deals more damage if it is Fire-type Digimon. Were Garurumon is an obtainable Digimon. 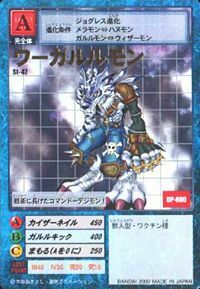 It can evolve from Garurumon or Gururumon regardless of its DP, and can evolve to Skull Mammon with 7 or less DP or Metal Garurumon with 8 or more DP. 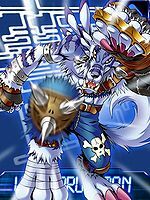 Were Garurumon is a Level 完 (Perfect) Ice Digimon card. It has 30 POW, +20 P, 1820 HP, 670 Circle, 500 Triangle, 0 Cross with Triangle Counter effect. Its Support Effect is recover user's HP by the number of cards in the POW slot X100. 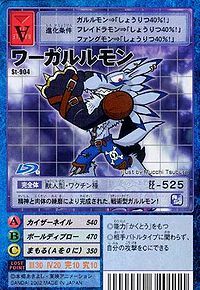 Were Garurumon card can be Special Fusioned with Metal Greymon card to create Omegamon II card. 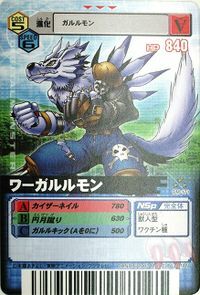 Were Garurumon is the fifth opponent in Sage Tower. 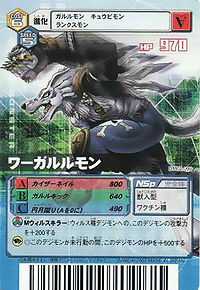 After clearing Sage Tower for the first time, the player can obtain a Hacking card by talking to Were Garurumon. In the post-story game, he will Jogressed with Metal Greymon to become Omegamon and challenge the player. 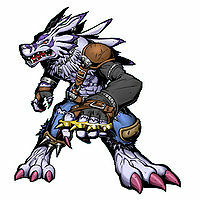 Were Garurumon can be evolved from Garurumon if above Level 28 and Friendship above 80%. It can evolve into Metal Garurumon if above 45 and Friendship above 90%. 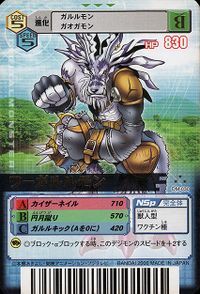 Were Garurumon can be evolved from Garurumon if above Level 35, Speed 170, and Beast EXP 4500. It can evolve to Metal Garurumon if above Level 52, Friendship 90%, and already befriended Gabumon. 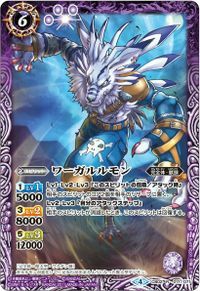 Were Garurumon is an obtainable Digimon which is evolved from Gaogamon, Garurumon, or Leomon, and can evolve to Metal Garurumon, Mirage Gaogamon, or Z'd Garurumon. It can also be obtained as a collectible card. 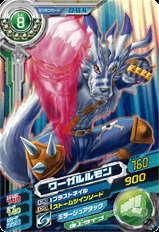 Its card is part of the Garurumon Evolution (ガルルモン進化 Garurumon Shinka) set. 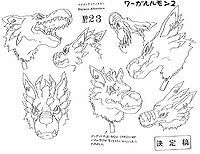 Were Garurumon can be obtained by Jogressing Hanumon, Garurumon, Meramon or Wizarmon with a compatible Digimon, and can evolve to Skull Mammon. 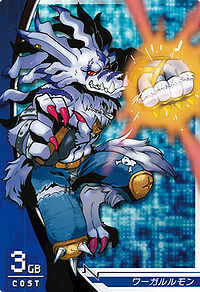 Were Garurumon is a partner Digimon. It can evolve from Garurumon. 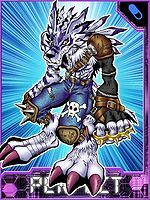 Were Garurumon can evolve from Garurumon or Igamon, and can be Jogressed with a compatible Digimon to get Metal Garurumon. 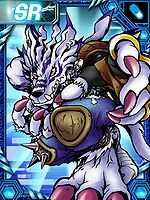 Were Garurumon can evolve from Garurumon. It can evolve to Metal Garurumon. This commando Digimon is a great fighter! It has honed its body to become its strongest weapon, a full-contact beast warrior! This commando-type Garurumon was completed through the training of mind and body! If it's close combat, leave it to me!! This combat type Digimon excels in attack, defense and tactics! 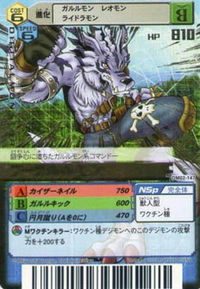 A Garurumon-species commando brimming with fighting spirit. A Beast Man Digimon that evolved from Garurumon. Its jumping power and combat abilities have improved significantly, allowing it to dish out powerful kicks. 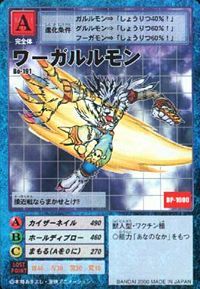 A Digimon that possesses outstanding jumping power even among other Digimon. It specialises in kicks using its powerful leg strength. A Commando Type that not only possesses the leg strength that Garurumon boasts of, but has also acquired tactical knowledge. Its jumping power is one of the best among Digimon. It has a strong sense of duty, and will remain loyal to whomever it has acknowledged as its master. 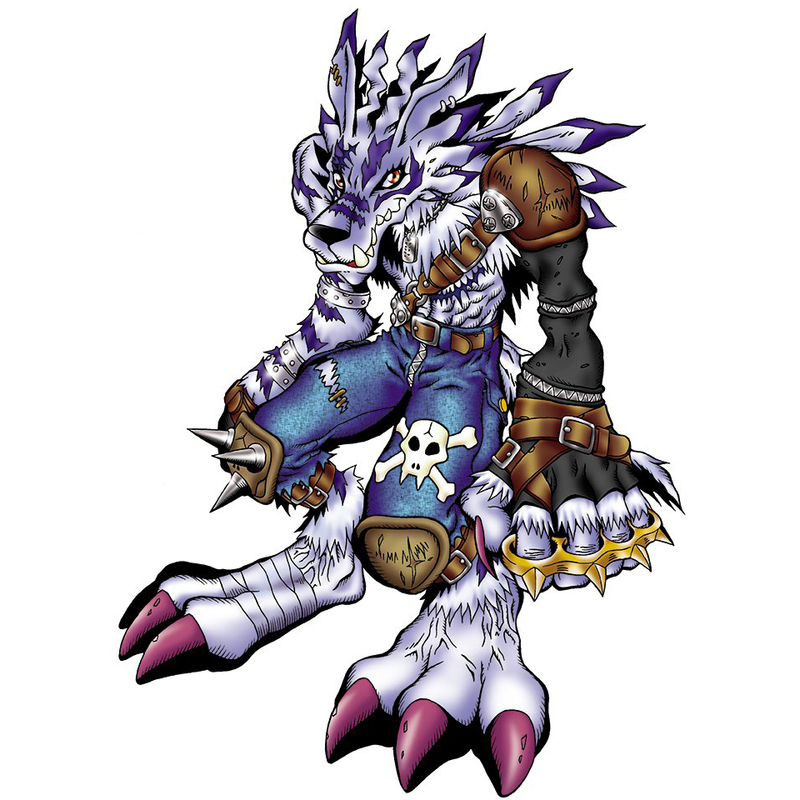 A Beast Man Digimon that evolved from Garurumon and became able to walk on two legs. It is highly loyal and has a reliable nature, and will faithfully execute any mission it is ordered to carry out by its master. 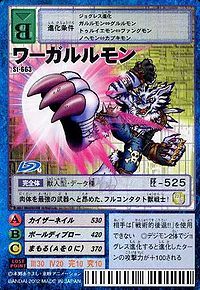 Its Special Move is cutting the opponent to pieces with the sharp claws on both of its hands (Kaiser Nail). 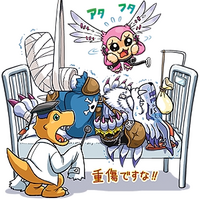 ↑ Digimon Adventure: "Oh Friend! 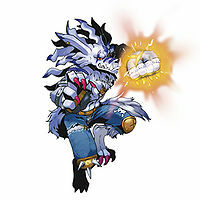 Were Garurumon"
This page was last modified on 16 April 2019, at 17:00.